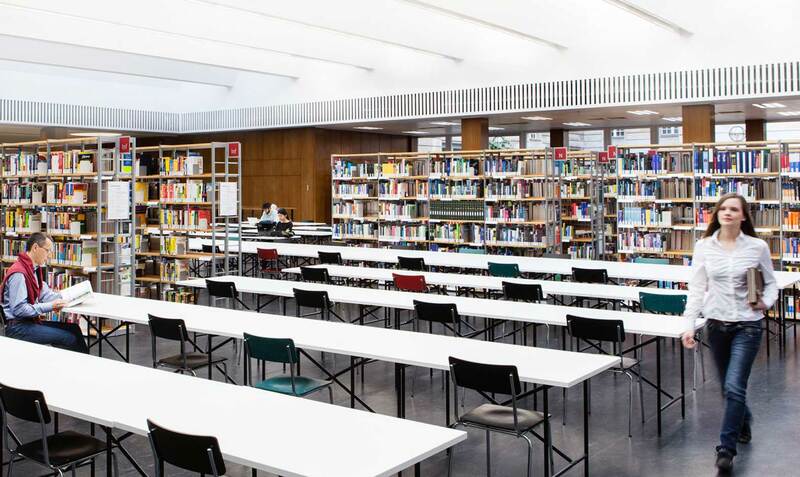 The ZLB (Berlin Central & Regional Library) is a member of the Association of Public Libraries in Berlin (VÖBB). The VÖBB website (www.voebb.de) also enables you to access your library account. You may borrow e-books, e-audio, e-papers and other e-media at voebb.de/digitale-angebote. While you are able to visit the ZLB and use many of its services without a library card, you will need one if you want to take materials home and/or use our advanced services. To get a card, it’s best to go directly to the ZLB or use one of Berlin’s other public libraries. This page contains more information on this. A reading room card allows you to request ZLB materials from restricted-access areas (stack and external stack) to be brought into the public areas. You can also use our PC work stations. Are you an institution/schoolafter-school care clubkindergartencrèche etc.? Then you can request a card for specific staff and departments. Please read our information sheet here. Since 8 September 2015refugees without official registration certificates or residence permits (i.e. new arrivals) have also been able to obtain library cards. These cards are valid at all of Berlin’s public libraries and the ZLB for three months. They may be extended by a further three months if required. Residence permits or accommodation certificates from initial reception centres must be presented as proof before library cards can be issued. You can have a library card issued to you during opening hours in the registration and borrowing areas of both ZLB branches, as well as in every other affiliated library of the VÖBB. All cards are valid for one year after the issue date. Adults are registered on site without filling in forms. All types of cards require you to bring a personal identification card or passport and an official confirmation of residence (except for the reading room card, which does not require a registration address in Germany). All types of cards require you to bring a personal identification card or passport and an official confirmation of resideIn order to register an institution, the person applying for the card must bring their personal identification card or passpor their official confirmation of residence. They must also fill out the corresponding registration form. Different fees are charged depending on card type. We offer discounts on annual cards for certain groups of people (students, children etc.). Relevant proof must be provided at the time of registration in order to obtain a discounted card. Late provision of proof or payment of fees will not be accepted! Fees are based on the latest Usage and fee regulations for public libraries in the Federal State of Berlin (BÖBB). You may only use your card once the card fee has been paid. When extending your card, you may only continue to use if once all relevant costs have been paid. Recipients of government aid allowances (“Arbeitslosengeld I and II” unemployment benefits, social welfare, basic benefits) with appropriate proof of “Berlin-Ticket S”/“berlinpass” or benefits notice. In order to issue a replacement card, we need a valid personal identification card or passport as well as an official confirmation of residence. A replacement card is subject to a fee of 2.50 Euros. Have you moved? Please notify us of your change of address as soon as possible so that our communications will reach you.